A Labradoodle is a cross between a standard poodle and a labrador and what was made from the genes was the most perfect dog. 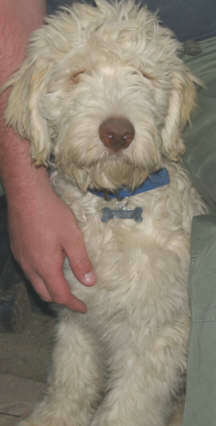 Internationally the Labradoodle is becoming a distinct breed rather than simply a "cross breed". These dogs first created in Australia to be the ultimate doggie companion and guide for human beings with sight impairment or total blindness. Dogs have no doggy odour even in wet weather, and most have little or no shedding in the best examples. the benefits of this are easily understood for a dog who is to live with you side by side, for many years. Labradoodles come in a variety of colours for example, black, white, cream, apricot cream, gold, red, apricot, chocolate, silvers and a few more not mentioned. Some labradoodles have a curly coat and others have more labrador traits and have a straight coat. Labradoodles are very loving dogs who, in the day are very active and full of beans and yet in the evenings, like nothing more than to curl up beside their owners and have their tummy's rubbed. They are cheeky, intelligent and make ideal family dogs and are great with children. They like a lot of attention, long walks, playtime and stimulation. Labradoodle terminology is F1 for the first cross then F2, F3, F4, ect for subsequent crosses. There is a small percentage of labradoodles who do shed, there is no guarantee that any labradoodle WILL NOT moult.